The rectangular self-inking stamp, hand-held embossing seal and All-States Recordbook of Notarial Acts. Blue Trodat 4913 - Ink stamp cased in plastic contains own ink supply-no extra ink pad needed. Hand-held embosser seal, Shiny Model-ES, chrome with metallic gray base. Rubber grip on handle creates ease of use for the perfect seal impression. ASN All-States Recordbook of Notarial Acts, 76 pages 222 entries. The rectangular rubber notary stamp, hand-held embossing seal and All-States Recordbook of Notarial Acts. *Traditional wooden handle ink stamp requires separate ink pad. Hand-held embosser seal, Shiny Model-ES, chrome with metallic gray base. Rubber grip on handle creates ease of use for the perfect seal impression. ASN All-States Recordbook of Notarial Acts, 76 pages 222 entries. Alabama online notary training course. 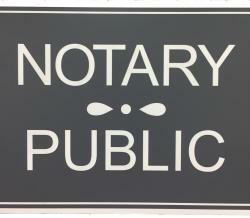 Indoor/outdoor plastic "Notary Public" sign measures 7 1/8" x 6". Gray with white lettering. 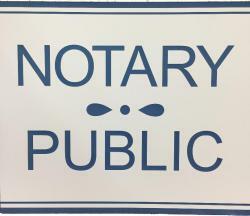 Indoor/outdoor plastic "Notary Public" sign measures 7 1/8" x 6". White with blue lettering. The inkless thumbprint pad provides clean prints and easy clean up...just rub your fingers and the ink disappears. MAINE NOTARIES NOTE: The Maine Secretary of State's Office strongly discourages the taking of thumbprints for "any reason." 10th Edition - 2018, 118 Pages - Spiral Bound (wire). The objective of this comprehensive notary study course is to provide standard notarial procedures and best practices to U.S. notaries. This comprehensive notary study course was designed to meet the educational needs of prospective and current notaries in the states that do NOT require a mandatory education course. Not an exam review course for states that require an exam. Includes Marriage Handbook, Ceremony Scripts (Traditional, Alternative, Spanish), 10 Blank Marriage Keepsake Certificates, and 10 Gold Foil Seals. Trodat Printy 4913 BLUE, Rectangular self-inking notary stamp. Highest quality stamp, non-slip rubber grip with a clear base window for easy placement of your stamp impression. Built in reinkable pad. *To view an image of this notary stamp impression, please click the "Add to Cart" button. You will be taken to the next page "Your Stamp/Seal Information". Choose your state from the list to view that stamp and seal impression images. The rectangular notary self-inking stamp and hand-held embossing seal. Blue Trodat 4913 - Ink stamp cased in plastic contains own ink supply-no extra ink pad needed. Hand-held embosser seal, Shiny Model-ES, chrome with metallic gray base. Rubber grip on handle creates ease of use for the perfect seal impression. Royal Mark seal impression inker is the convenient way to darken your embossed seal impression rendering the impression to be photographically reproducible. No mess, knob-style inker makes it easy. Black ink. Provides Notary Procedures and Statutes for Delaware Notaries. Notary Recordbook (Journal) - 76 Pages, 222 separate entries. Allows the option of recording three notarial acts per entry, for multiple signings with the same signer. Great for notary signing agents! Recordbook also offers space for a thumbprint.